Robert Hamilton was the son of Mary Hamilton. He was born about 1892 in Clabby, County Fermanagh, near Fivemiletown. He and is mother later moved to Kilmore East, Scotstown, County Monaghan. He worked as a servant. Robert Hamilton was a member of the Ulster Volunteer Force in County Monaghan. Robert Hamilton enlisted in Monaghan in the Royal Irish Fusiliers when a recruitment party came to town in February 1915. He was later stricken with fever and was brought back to Britain as an invalid. He then returned home to Monaghan to recuperate. 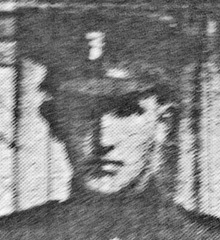 Private Hamilton left Ballinode on Easter Saturday, March 30th 1918, and returned to his unit on the western front in France, Private Robert Hamilton was serving with the 9th Battalion of the Princess Victoria's (Royal Irish Fusiliers) when he was killed in action on 19th April 1918, three weeks after rejoining his unit. The Tyne Cot Memorial to the Missing forms the north-eastern boundary of Tyne Cot Cemetery, which is located 9 kilometres north east of Ieper town centre, on the Tynecotstraat, a road leading from the Zonnebeekseweg (N332). The names of those from United Kingdom units are inscribed on Panels arranged by Regiment under their respective Ranks. The names of those from New Zealand units are inscribed on panels within the New Zealand Memorial Apse located at the centre of the Memorial.